I check in and read A LOT of blogs. I find them through Pinterest, through your comments, through other blogs... and I get sucked in. Work hazard? Maybe so? And what I really love is when I find out those bloggers that I read and follow, also post a thing or two about organizing! 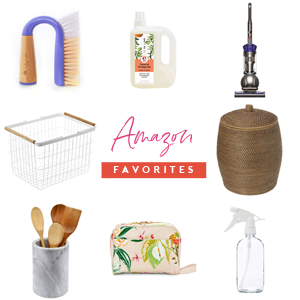 DIY, organizing, decor and more?! Yes please thank you! 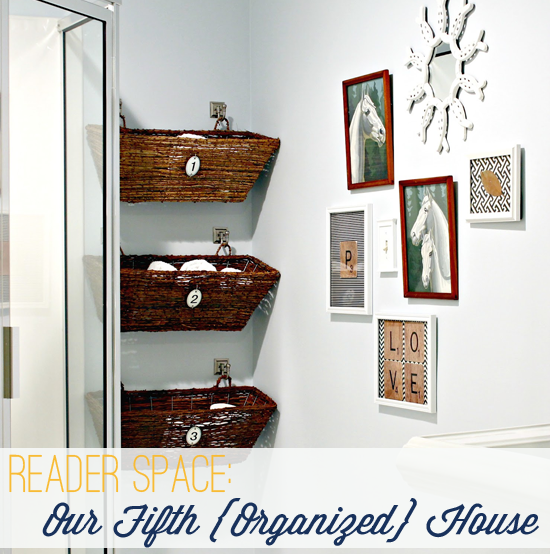 I have been reading, Our Fifth House for awhile, and Carmel always throws in great and stylish organizing. I asked her if I could share a few of her favorites here today! Lucky for me, she said, "yes!" Carmel selected her absolute favorite organizing projects and is here now to share them with us! "Hello, I'm Carmel from Our Fifth House, and I'm thrilled to be here today! I'm continually inspired by Jen's amazing organization projects, so I was beyond excited when she asked me to share a few of my own. 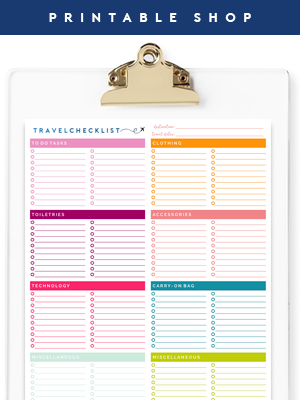 I'm a big fan of anything that simplifies my life, so organization makes me flat out giddy! I've found for myself that two things hold true: 1. If I take the time to "make it pretty" I'll do a better job of keeping it that way and 2. Starting somewhere is better than not starting at all. 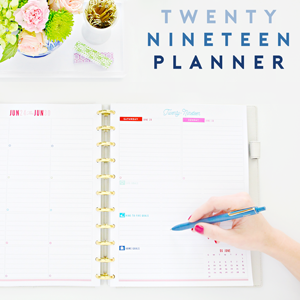 In years past I've made the mistake of thinking it had to be a "major overhaul" every time, but that just made organizing seem like way too much work - so I very often avoided it - which led to chaos - which drove me crazy - which is why I decided it's okay to do a little at a time. You know that whole Rome wasn't built in a day mantra? Well, that's how I roll where organization is concerned. Instead of forcing myself to tackle an entire room, I take it one cabinet/drawer/closet at a time. Hopefully one day my whole house will be beautifully organized! Fingers crossed. 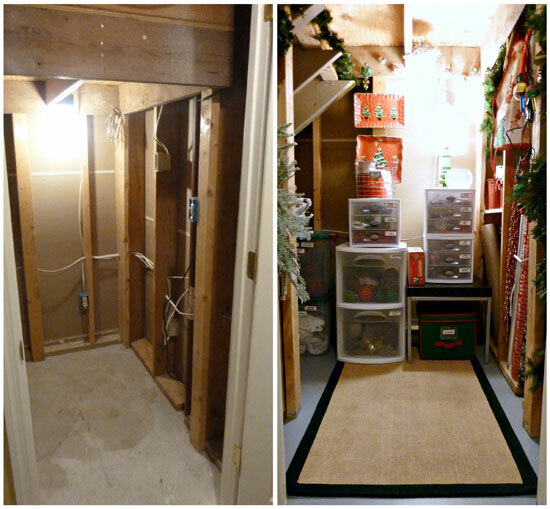 I turned the unused, unfinished storage closet under the basement stairs into my very own North Pole! It makes me down right jolly! Without a doubt that was the best organization project of 2011 and it made decking the halls this year even merrier! Pulling as much as I could out of bins and using the walls to hang things helped me to cut down on the number of bins I needed. I actually donated 3 large empty storage bins to the Goodwill. I was really amazed at how well all my stuff fit in here. I thought for sure that I'd never be able to make it all fit and still be able to walk in here. Using plate hangers, nails, and hooks, I was able to make storage in this closet easy to access. Plus it makes the closet look really festive! Now I get to have a little bit of Christmas all year long! I love having all my Christmas stuff in one easy to get to and garage-grime-free place! Everything from my wrapping supplies.....to my crafting stash, holiday dishes, and decor all fit right inside my very own little North Pole! 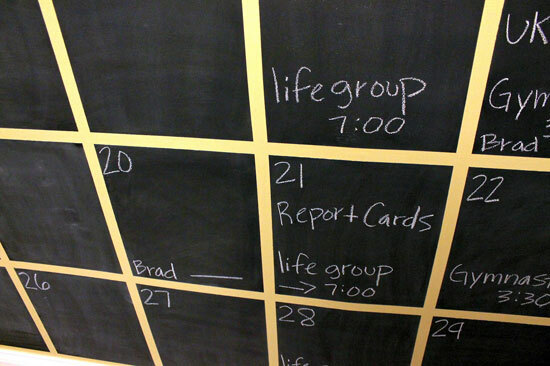 As far as 2012 goes, the giant wall sized chalkboard calendar that manages our daily chaotic schedules is the project that gets the most everyday use and truly helps my forgetful mom brain. No more "mom you forgot I'm supposed to bring snack today" going on around here anymore. I wanted to do something special with that wall. With two active, school aged kids we. are. busy. - like busier than we've ever been. There's always a practice, a game, a birthday party, a book report due, and the list goes on. Add to that my hub doesn't work a typical 9 to 5 job, so I have to keep up with his schedule too. Anyhow, to make a long story short I wanted to put a family calendar in our mudroom space, where we will all see it as we're coming and going. We desperately needed something to help us manage our daily chaos! I've never been good at keeping important dates and reminders on my iPhone, so having a calendar I can write things down on was really key for me. It took 3 coats of chalkboard paint. I started pulling the tape off before the last coat was dry. I did have to touch up the lines in a few areas, but overall the tape gave me nice crisp lines! But as I mentioned earlier, every project isn't a major one, and very often the littlest ones are the ones that make the biggest difference in our lives. The light bulb moment I had when I realized that perfectly folded sheets weren't in the cards for me is one that has helped my linen closet out immensely. Realizing that bathroom storage can hang out in plain view has helped clear some space in my linen closet and made the "I need toilet paper screams" stop completely. These window boxes are so great for storage. They're nice and deep; perfect for holding towels and toilet paper. They had a plastic lining in them, and I just cut it out. The metal number signs are something I added to dress them up a little. I borrowed them from the metal pots I had on my potting bench and used a little twine to tie them on the front. And last but certainly not least finally forcing myself to do something about the under the sink craziness has made a world of difference! I pulled everything out, sorted it in piles, cleaned the inside of the cabinet, and then grabbed a few helpful organization pieces from around the house before putting what I was keeping back in there. My goal was to keep everything front and center. I'm all about easy access. The wire shelf I bought at Big Lots to use in the kids bathroom was redirected to the kitchen instead. The lazy susan I picked up for the spice cabinet weeks ago, but since it didn't fit in there it's being put to work keeping all of my cleaning sprays within reach. The command hook is perfect for hanging my swiffer duster handle, and the wall mount paper towel holder that I purchased at BB&B the next morning was the perfect solution for keeping them within reach but not in the way. It really does help to take advantage of the vertical storage space you have. Thanks Jen for having me over today! And thank you so so much for always inspiring us all to get our organization on!" Isn't she incredible? 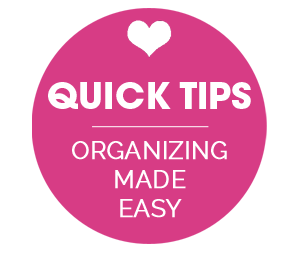 I love all of her ideas and how she turns every organizing project into simple awesomeness! Turning a storage space into the coolest wrapping station ever? How much fun is that? And rolling sheets instead of folding? I love when practical can still be charming. And that chalkboard calendar is by far one of the sweetest I have ever seen. It is HUGE! But so much fun and something the whole family can see and enjoy. It just makes amazing sense! And lets take a minute to chat about those window box baskets? Not only do they work wonders in the loo, but they would also be amazing in-boxes for each family member in a mudroom. Or a great way to stash toys in a living room or playroom! Or hold some books in a bedroom! Love the versatility and how simply beautiful they are! You can find more details for each project in the links provided above, and be sure to check out Carmel's home tour when you visit her blog... It's scrumptious! Wow! What a great reader space. I love, love, love her North Pole closet! What an original idea. So many good ideas and very inspiring. Thanks for sharing! Thank you so so much Jen! What a thrill to be featured on one of my favorite blogs!! Love them all. Thanks for sharing the inspiration. I need to get organized! I love so many things about this house, especially the kitchen! I pinned two pictures, hope that is ok, I tried to comment on Carmel's blog, but couldn't, please let her know! 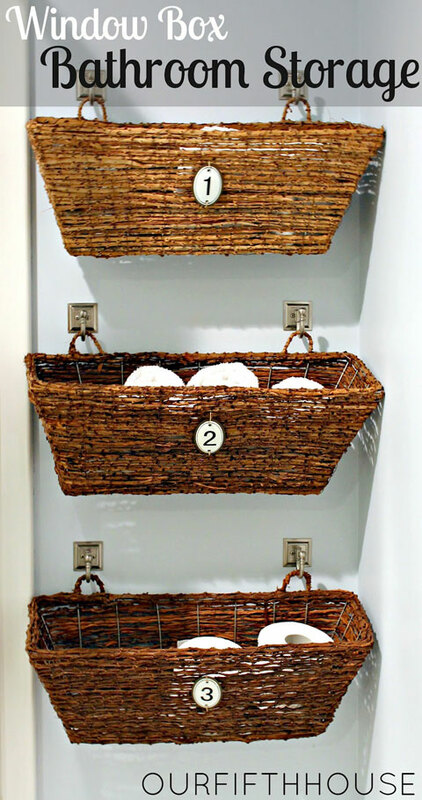 Those baskets used for storage is such a great idea! Im going to replicate that in my home! I just don't know where yet! Thanks for the great ideas! Love this post!!!!! Another blog to add to my Reader list. :<) I love, love, love the chalkboard calendar and the Scrabble art! So fun. Thanks for sharing, Carmel! 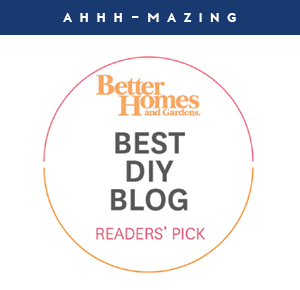 I just found Carmel's blog a couple of weeks ago and have a hopeless crush on her entire home! I love how simple and resourceful all these projects are...not to mention totally beautiful! Such great ideas! Great idea! I've used magnetic primer before and loved the results. Holy Christmas, Santa Claus!! That "North Pole" room is amazing! 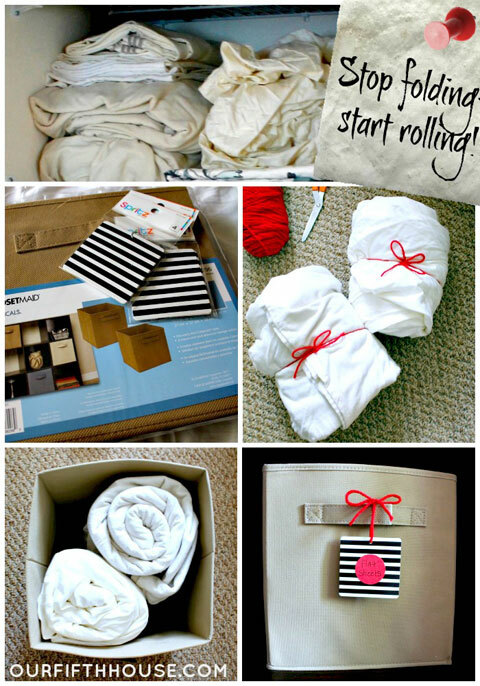 I also love your idea of rolling sheets instead of folding them -- so much faster! Love the North Pole area and that blue in the bedroom is scrumdiddlyumptious! 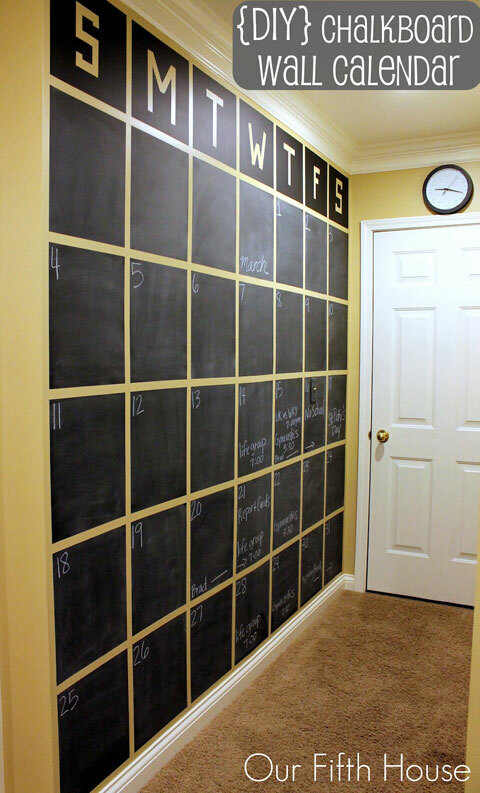 I had a chalkboard wall project waiting for my kitchen, but now I'm considering trying out her chalkboard calendar. Thanks for sharing. Okay, I'm totally going to start rolling all my sheets in my linen closet! :) It's all beautiful, but I'm going ga-ga over your dining room!! The chalkboard wall is awesome. But what I really love the most - the under sink organization: the side mount paper towel bar. Freaking GENIUS! I got several good ideas and really appreciate your photos and encouragement to do something! I loved all her ideas!!! Wow!! That kitchen makes me smile. And I LOVE, LOVE, LOVE the giant wall calendar!! Oh my goodness! 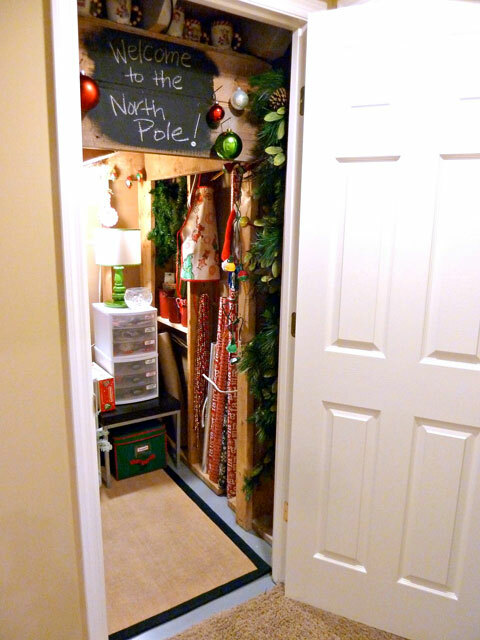 That Christmas closet is amazing!!! What a fantastic idea! I'm also super in love with that full wall calendar. Perfect to keep the whole family organized!!! Maybe even use chalk markers in different colors for each family member. 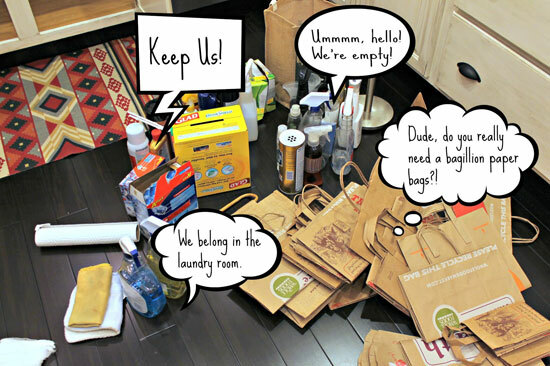 Shopping bags are the bane of my husband's existence. After folding, how did you keep them so neat? Whatever is was, it was genius. I cut the top of one bag off and put the rest inside - super easy and they take up much less space this way! So clever! Thank you for the reply. Another marriage saved. Love that chalkboard! Great post. You've given me an idea with those window boxes. Thanks for the inspiration. I'm off now to check out your blog! Such great ideas. Love the Christmas "North Pole!" I adore Carmel and her home. She's got such great style and the organization is the icing on the cake! Great ideas!!!! I love the huge calendar on the wall...it's brilliant!!! 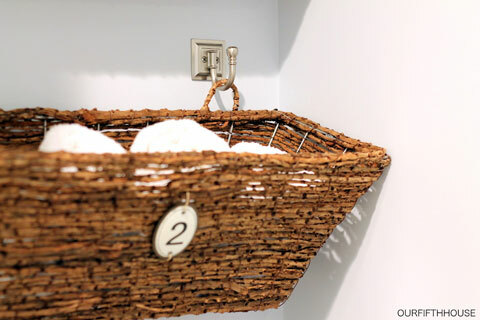 I love love love the baskets on the bathroom wall. 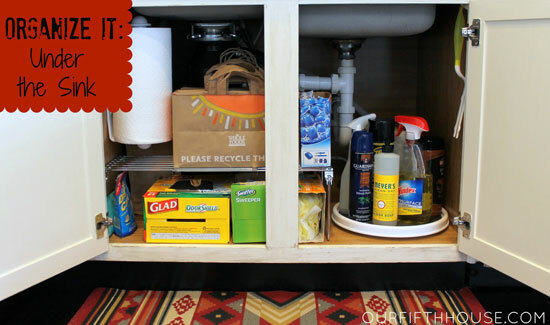 Makes it so easy for guests so they don't have to "quietly" look through your cabinets for TP or an extra towel. Will be doing that!! !